A group of Russian urban climbers have managed to scale the Eiffel Tower in Paris despite tightened security due to the terror threat. They told RT how they managed to sneak into the iconic landmark and why workers mistook them for terrorists. Ivan Kuznetsov from Moscow organized the daring adventure back in May this year ahead of the Euro 2016 football tournament. “I thought a lot about how we would be able to sneak through security, because after the terrorist attacks [in Paris back in November 2015 when Islamic State fighters killed over 130 people] the atmosphere was very tense,” Kuznetsov told RT. However, the adventure wasn’t all pain sailing for the daredevils – as they were climbing down a worker spotted them and called the police. However, when the police realized that the guys were urban climbers, or 'roofers' as they're called in Russia, and they were not planning to blow up the Tower, “their reaction was not negative at all,” Kuznetsov said. 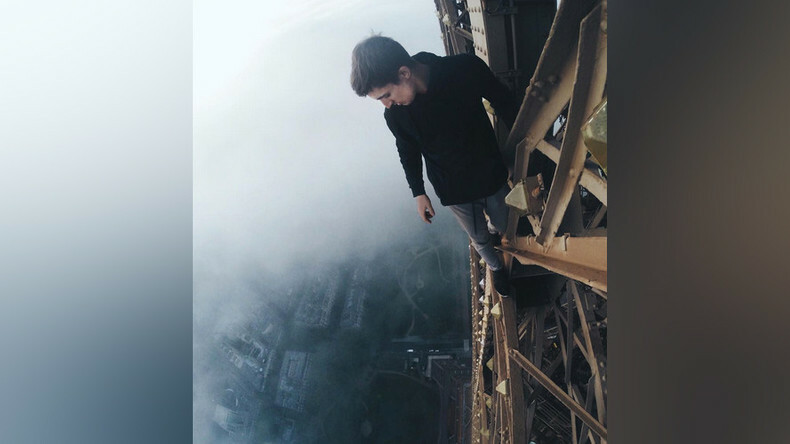 The climbers filmed their exploit while it was raining and winds reached 6 meters per second, Kuznetsov wrote on his page on Russian social network Vkontakte.